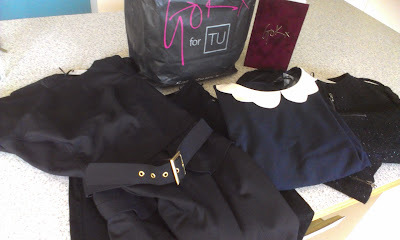 I was so excited to be sent the lookbook for Gok's new collection for TU at Sainsburys, last month. Since his last collection, which I found a bit too work-wear driven, I'd been tweeting Gok and his right-hand man Mark asking for more casual pieces in this next collection. And he's delivered with a great mix of very wearable day-time pieces as well as some amazing dresses & skirts. So when I was invited to pick some pieces from the collection, the only dilemma was how many samples to request without being told to clear off! Clearly I didn't ask for too much as a lovely wrapped parcel arrived today containing all that I'd asked for..
Next is this gorgeous peplum belted dress, priced at £45. Tried it on this evening and it's stunning on - so flattering. I'm going to wear it to a fashion show tomorrow night! The boucle biker style jacket just seen in this photo is priced at £45. As it's a little longer than most of the boucle jackets out there at the moment, it's much easier to wear - especially if you're long in the body as I am. Finally, I chose a pair of black skinny jeans that are worthy of the name Perfect Skinny Jeans - £28. Divine. Well done Gok - the quality and fit of what I've been sent has me already planning a trip to my local Sainsbury's to get the jeans in another colour and to check out this 'Must Have Trench'.. I love Gok...He is great and I love his TV series. That sounds like such a nice plan. I am going home this weekend (not far from Derry) so I am going to drag Hubbie into Derry and hopefully Sainsbury's. I am not sure if they stock much of Gok's collection, but I am going to look. I bought the sparkly jacket at the weekend and it is just lovely. Just need an occasion to wear it now! OOOH - lucky you !! Great choices. I cannot wait to see how it all looks on you. I have no idea why my comment there converted the words t r e n c h coat to a link by the way?! Unintentional. How weird! 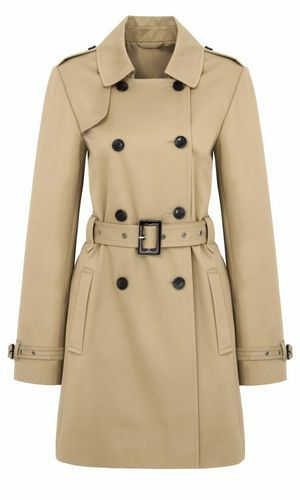 I like this colection especially the peter pan collar shir and th trench coat!